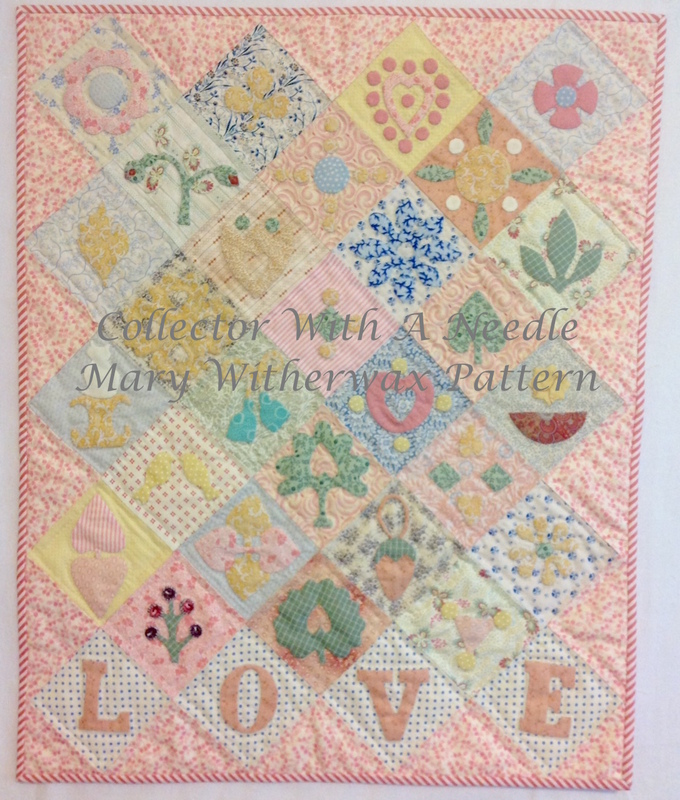 Welcome to the Mary Witherwax pattern page. There is a private Facebook Group for owners of our pattern. We purchased the original treasure at auction and created a high quality professional appliqué pattern so you can create your own! We included optional blocks of our own design if you want to replace any of the letters of blocks. 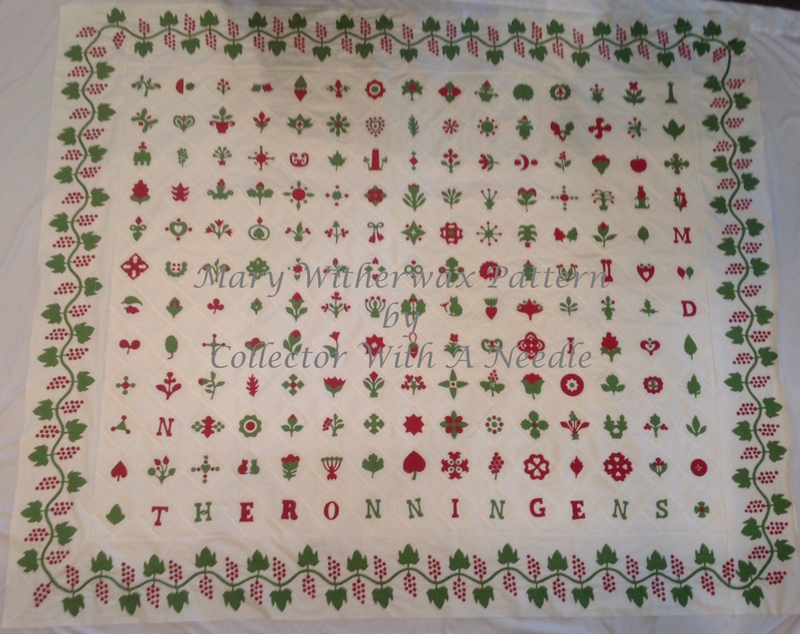 The pattern includes the full alphabet so you can include any words you want. The pattern file is 57 pages of printing. 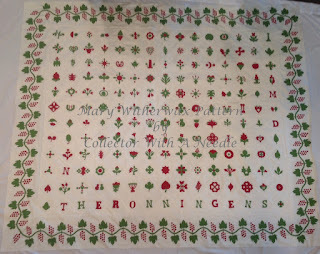 $45 for the complete pattern, border, extra blocks and borders. The pattern is an instant digital download. When you complete payment, the PayPal email account you paid will receive an email with the file link. Click on the link, set your printer to print actual size, Click Print. The file is 57 pages. Once you have the pattern you will receive an invitation to the private Facebook page, you don't have to join the Facebook page - its optional. The pattern is instant, the Facebook invite is manual from me and might take a few days if I am traveling. Use your favorite fabrics to create your own look. Karen enlarged the digital patterns to a larger block size. 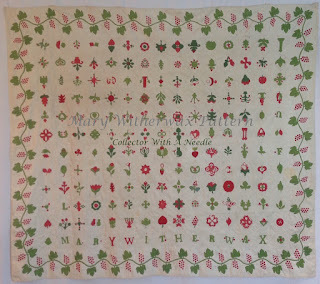 She needed fewer blocks to create a full size quilt. 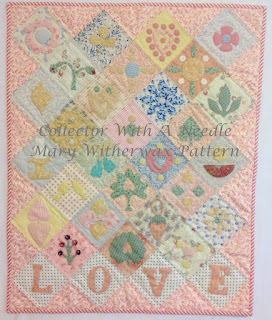 She also used a border stripe print to replace the applique border. Oh my! Another lovely applique adventure! What fun! I simply cannot resist! This pattern has so many possibilities! Thank you, Dawn!